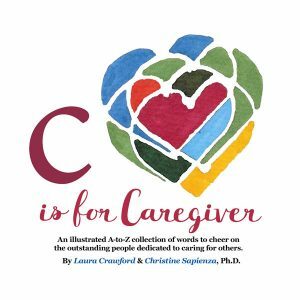 C is for Caregiver is not a reference source filled with tips on how to better manage the complex task of being a carepartner. It does not have a bibliography, because this slim volume has no academic ambitions. Hey, it doesn’t even have an index, because it clearly goes from A to Z, dedicating one page spread to each of the letters of the alphabet (an index seemed kind of overkill). It is an alphabet book for adults that just wants people to smile and feel happy, if only for a moment. It is the printed (or digital) intention of telling someone “We understand you, and your efforts are appreciated”. If just one of its texts or illustrations make you feel two ounces better, it will consider its mission accomplished.